Jean Renoir's classic film is coming to high-definition at the end of November. In an early announcement to retailers, the Criterion Collection will bring 'The Rules of the Game' to Blu-ray on November 15. 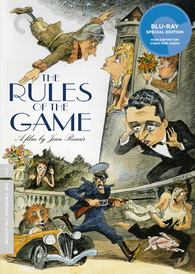 The Blu-ray will feature a new 1080p digital transfer, a mono soundtrack, and supplements include: Introduction to the film by Jean Renoir; Audio commentary written by film scholar Alexander Sesonske and read by filmmaker Peter Bogdanovich; Version comparison: side-by-side analysis of the film’s two endings, and an illustrated study of Renoir’s shooting script; Selected-scene analysis by Renoir historian Christopher Faulkner; Excerpts from Jean Renoir, le patron: La Règle et l’exception (1966), a French television program directed by Jacques Rivette; Part one of Jean Renoir, a two-part 1993 BBC documentary by David Thompson; Video essay about the film’s production, release, and later reconstruction; Jean Gaborit and Jacques Durand discuss their reconstruction and rerelease of the film; Interviews with Renoir’s son and assistant cameraman Alain Renoir, set designer Max Douy, and actress Mila Parély; Written tributes to the film and Renoir by J. Hoberman, Kent Jones,Paul Schrader, Wim Wenders and others; and a booklet featuring writings by Sesonske, Renoir, Henri Cartier-Bresson, Bertrand Tavernier, and François Truffaut. You can find the latest specs for 'The Rules of the Game' linked from our Blu-ray Release Schedule, where it's indexed under November 15.